“Every experience you have seems to have its own life story, with a beginning; a middle; and eventually, and end. However, there is danger in seeing events as separate from one another, since in fact they are all part of a continuity and a greater evolution. 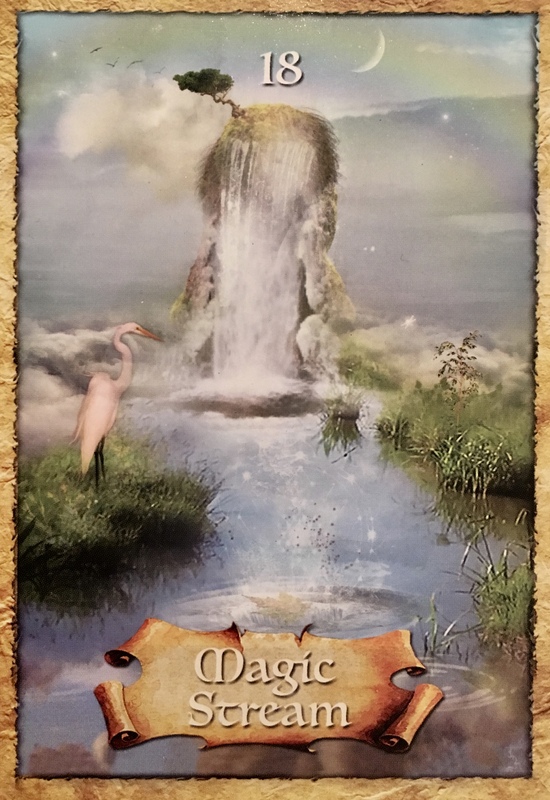 Like an ever flowing Magic Stream, your experiences filter through the whole world, one leading into another, informing and influencing still more. Inspiration, invention, and revelations rarely come to just one person. The collective awareness is a shared storehouse of potential. When you remember that you are a part of the fluid continuity of life, you become a channel for great inspiration. Allow the magic to flow through you and carry our dreams into reality. Your success will benefit many. Magic Stream as Challenger: “If Magic Stream comes to you as challenger, it represents swimming against the current. There are times when effort and sheer willpower result in victory and celebration, but this is not one of them. You cannot force inspiration, and you cannot manufacture creativity, lest you borrow too heavily from others’ ideas. Neither can you make someone love you or orchestrate a series of events that might place you in a more favorable position. Do not ignore the creative flow, especially right now. There are ideas coming to you and your ego may jump in talking you out of them. You may doubt your abilities or whether you are ready. But this is a time to experiment. Let the ideas flow and let your own creative juices flow up to meet them. See what comes to you and what formulates. Maybe it starts out as a hobby, past time or passion; it does not have to be your livelihood right away. But give yourself some space to expand on your ideas. Journal, write them down if you just can’t manage to take them on at this time, you can go back later on and add to your ideas. If you have the means to dive in and just do it, all the better, get in there and get your hands dirty! These are the early stages of manifestation and it is important to let it flow so that you can get clear later on what exactly you wish to create. Be open and receptive and watch for signs. Let nature inspire you and spend some extra time outdoors admiring all the amazing creations of our Great Mother, Gaia. Know that this creative process is necessary and will open doors for you, leading you in exactly the direction you need to go. Let the magic flow through you. Everything you desire is in the stream, in the flow. It is there for you, there to be received by you. You never have to swim upstream to get it; you simply have to trust in the process and go with the flow.